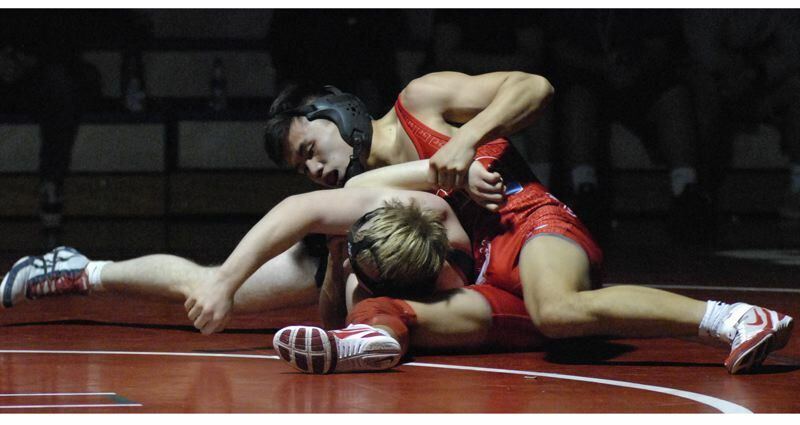 The Centennial wrestling team appeared to be on its way to a big early-season win up 30-3 over Sandy almost halfway through Thursday night's dual. Then came the landslide — seven straight Pioneer victories — which allowed the visitors to leave town with a 37-36 team victory. The Eagles scored a forfeit and three pins to start the night, putting the first 24 points on the scoreboard after Mufezul Yusun broke open a tight bout at 126 pounds with an escape and a takedown in the third period. He worked his final advantage into a fall with 0:08 on the clock. "I wanted to get the win," Yusun said. "I rolled her up and got the pin." Tui Laithang battled back from as many as six down at 132 pounds, and gave himself a chance after earning an escape and shooting into Colby Giltner's legs for a takedown with a minute left. He spent about 30 seconds working for the go-ahead back points, but Giltner slipped loose with 0:32 left to secure the 13-8 decision that gave Sandy its first points. It appeared that would only be a hiccup in the team score when Centennial's reigning state champ Phillip Kue took the mat next at 138 pounds. He took a 10-4 lead into the third round before patiently working his way into strong position out of the bottom position for a reversal that soon led to a fall. Once the referee slapped the mat, Kue leaped into the air and let out a shout of emotion. "I've had some trouble keeping kids on their back," Kue said. "I wanted to score as much as I could, then I got him to his back and had to make it happen." The pin put Centennial seemingly in charge up 30-3. The Pioneers won the next three bouts all by first-round pins. 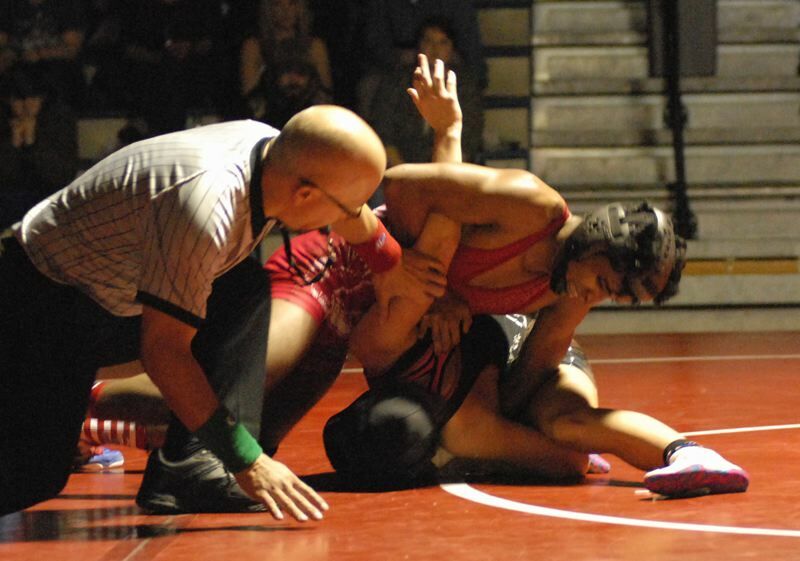 The most exciting coming from Leo Rios at 160 pounds when he trapped his opponent's elbow and dragged him back into the circle to get the pin with two ticks left in the first round. "It's always exciting when you get into those short-time situations," Rios said. "It was a change of heart for us — it felt good to be racking up pins." Ivan Hall followed with four near-falls at 170 pounds to claim a 17-7 major decision, giving Sandy a bonus team point which would prove to be the difference at the end of the night. "For us to win tonight, we needed everyone wrestling at their best, and they found a way to come up with it," Sandy coach Larry Topliff said. The most entertaining bout came at 182 pounds where Sandy's Luke Weber posted a 5-0 shutout in the first period only to see Centennial's Bailey Sparks get in on his opponent's hips for three quick takedowns to tie the score at 10 as the clock slipped under a minute. Weber got an escape to regain the lead, while Sparks hunted for the winning takedown. He took several shots, but Weber countered to stay on his feet. The two met in the center circle for a restart with 0:07 on the clock. Sparks got in on his opponent's legs and slipped behind Weber with the clock showing all zeroes. The two referees gathered for a moment before Weber had his hand raised for the 11-10 decision. Sparks' final attack came up a split-second short. Two weight classes later, Sandy's Jack Rademacher scored a pin 50 seconds into his 220-pound bout to secure the dual win for the Pioneers.